Kel Executive Services, led by Frank Keller, annually provides the overall security coordination for the entire Bonnaroo Music Festival. With mounted security as a portion of the overall plan, KES and A&O have made Bonnaroo one of the safest music events in the country. KES personnel oversee six additional security companies that provide specialized security teams for different facets of the comprehensive plan. KES was honored to provide security services for one of the nation’s largest downtown urban festivals, Music Midtown. The festival was founded in 1994 in Atlanta’s beautiful Piedmont Park. The lineup in 2017 included Bruno Mars, Mumford & Sons, Weezer, Future, Blink-182 and dozens of other rock, hip hop, pop and electronic acts on four stages. Music Midtown is a non-auto festival with fans arriving by mass transit, Uber, bicycle or on foot which presented a whole different set of security challenges than the big camping festivals. More than 80,000 people came each day on Saturday and Sunday. Frank Keller of KES, under contract from Festival Management Services, oversaw security at Fare the Well in Santa Clara and served on the staff at Chicago’s Soldier Field. Fare the Well was a series of concerts which were performed by most of the surviving members of the Grateful Dead: Bob Weir, Phil Lesh, Bill Kreutzmann and Mickey Hart, joined by Trey Anastasio, Bruce Hornsby and Jeff Chimenti, to celebrate the 50th anniversary of the Grateful Dead. The performances took place at Santa Clara’s Levi Stadium on June 27 and 28, 2015 and Chicago’s Soldier Field on July 3, 4 and 5, 2015. These performances marked the first time Weir, Lesh, Kreutzmann and Hart had performed together since the Dead’s 2009 tour and was publicized as the final time the musicians would all perform together. The Alpha & Omega Mounted Security Patrol made its debut at the Coachella Valley Music and Arts Festival in 2009 and has served at every festival since. Coachella’s diverse offerings and huge audiences create unique security needs. Troopers on horseback provide entrancing controls, parking supervision, crowd management, traffic control, substance control, and regulation of illegal vending. They also serve as mobile information centers for fans needing directions, medical help, and other instruction. The popular indie-rock festival is held on the grounds of the Empire Polo Fields in the desert town of Indio, California. Thousands of fans from around the world gather for top name acts like Paul McCartney, Morrissey, My Bloody Valentine, Public Enemy, The Cure, The Killers, White Lies and hundreds of other well-known and up-and-coming musical acts. The festival also is celebrated for its staging of large sculptural and interactive art. Alpha & Omega Troopers were on hand for their first security assignment at Stagecoach 2009. They continue to serve annually at California’s top country music festival featuring a top-tier mix of artists from the genres of mainstream country, bluegrass, folk, roots rock and alt-country performing in three distinct performance areas. The critically acclaimed gathering also includes a variety of activities including a leading BBQ competition and camping area with amenities exclusive to campers. Past line-ups have included Brad Paisley, Kenny Chesney, Reba, Kid Rock, Miranda Lambert and dozens of other performers. A&O Mounted Security Patrol initially brought its special brand of festival security to Golden Gate Park in San Francisco for the inaugural Outside Lands Music & Arts Festival in August, 2008, and has continued annually ever since. The multi-faceted festival features top musicians and many newcomers along with local acts in an effort to represent San Francisco’s vibrant cultural community. A&O Troopers handle a number of security functions including parking, crowd control, escorting artists through crowds, assisting in medical emergencies, and offering directions and assistance to fans. A&O has also previously provided security at Golden Gate Park during The Dave Matthews Band concert. New in 2017 to the A&O festival roster was KAABOO in Del Mar. Headlined by Red Hot Chili Peppers, Pink, and Tom Petty and the Heartbreakers, this festival featured hundreds of top musicians plus much more. Offerings included an air conditioned comedy theater, artisan beers and limited production wines, spa services, art installations and contemporary art fair, pool and sand parties, and a late night indoor dance club. Festivals like this one with a wide variety of entertainment options have become a specialty of the highly trained and elite A&O festival unit. The A&O mounted patrol provided security for this festival on Florida’s largest lake. Some 50,000 fans heard acts like Bassnectar, Usher and The Roots, and Kings of Leon as well as enjoyed activities such as yoga, art, and meditation. Phish music and camping festivals became a model for large music festivals in the United States in the mid ‘90s. Concert planners built mock cities with roads, movie theaters, potable water, multiple stages, retail centers, and varied entertainment. The A&O mounted patrol was a popular and effective means of crowd management for these festivals. 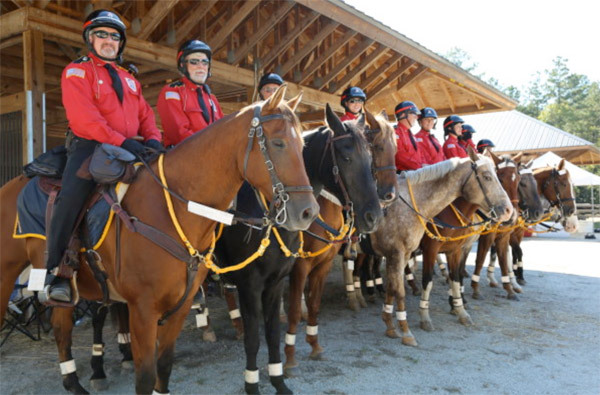 Uniformed riders patrolled atop highly trained horses with a wide field of vision to spot potential problems. Over the years, fans became accustomed to the friendly and helpful Troopers. A&O joined Phish at the Clifford Ball, the Great Went, LemonWheel, New Year’s Eve at the Big Cypress Seminole Indian Reservation, Oswego, IT, Coventry, Festival 8 and Super Ball IX and Magnaball. Plus, A&O riders provided security for the band at many amphitheaters and smaller outdoor venues. The appearance at Coventry in Vermont represented a “full circle” of sorts for the mounted enforcement unit and Phish. A&O began its concert division with Woodstock 94 where Phish band members first encountered them. They were invited by Phish to the Clifford Ball concert in 1996. This classic Phish music festival launched what has become an annual summer festival tour for A&O elite riders. A&O Mounted Patrol provided public safety services for Hardly Strictly Bluegrass for a free festival in Golden Gate Park in San Francisco. The festival features bluegrass music, but includes many other genres. More than 400,000 fans enjoy the great music and historic setting for three days of fun. A&O Troopers handled a number of security functions including parking, crowd control, escorting artists through crowds, assisting in medical emergencies, and offering directions and assistance to fans. A&O Troopers have provided security for the Electric Forest Festival at the Double JJ Resort in Rothbury, Michigan, for the last three years. The festival has many unique features including a forested venue, waterpark, pop-up restaurant and live painting performances. Popular band The Stringed Cheese Incident has headlined the festival all three years with dozens of additional acts appearing on five stages. Full scale security planning is provided by Kel Executive Services for this annual multi-day electronica dance festival. Venues have included the Dallas Convention Center and the historic Dallas Fair Park. Kel Executive Services directed security for TomorrowWorld, the 3-day electronic-based music festival, and A&O provided mounted security services. The festival featured dozens of the world’s top electronica entertainers. The multi-experience festival was staged at a 3- mile venue along a scenic waterfront locale on the banks of the Chattahoochee River. A&O was proud to be a part of Mysteryland’s inaugural U.S. event. Mysteryland has been a leading pioneer on the dance festival scene in Europe and the US since 1993 and has inspired numerous other organizers and events. It is the first music festival to return to the hallowed grounds where Woodstock took place. Mysteryland has had a tremendous impact on the music world and it is the logical festival to follow in the footsteps of the original ground-breaking music event. Woodstock represented the music of a new generation and cultural tour de force for the changing times, and today Mysteryland brings together the global forces of dance music for the new generation’s revolution. 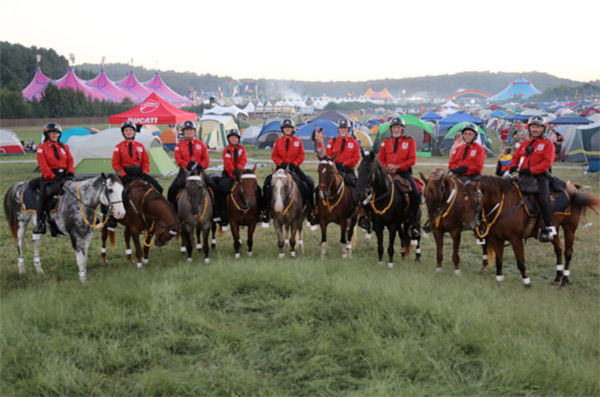 The A&O Mounted Patrol expanded outside the United States to serve at the Pemeberton Music Festival. 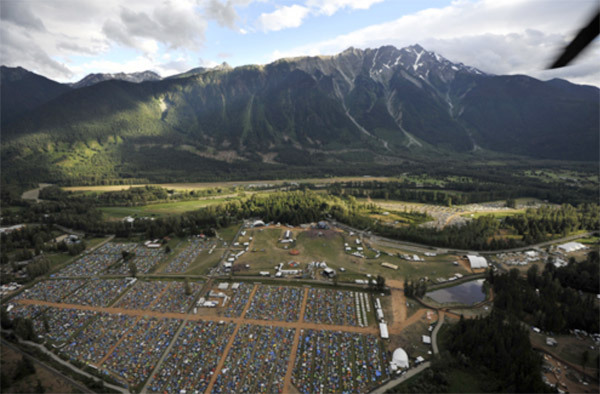 Pemberton was a five-day contemporary music festival near the foot of majestic Mt. Currie. Performers included Nine Inch Nails, Outkast, Soundgarden, Frank Ocean, Snoop Dogg, The Flaming Lips, Violent Femmes and dozens of other bands. Smooth traffic and one of the world’s most majestic settings welcomed over 75,000 festival patrons who enjoyed nearly 100 performances. Comedy, camping and camaraderie made for a perfect festival. A&O provided an experienced courtesy patrol on horseback to direct traffic, monitor crowds, promote safety, and provide directions. The A&O Mounted Patrol served the inaugural Interlocken Music Festival, providing public safety services, and returned for the second annual festival. The festival at the foot of the Blue Ridge Mountains breaks from tradition somewhat by offering repeated sets by a smaller number of bands over the 4-day festival. The 2014 festival offered some of the biggest names in jam band music: The String Cheese Incident, Phil Lesh & Friends, Tom Petty & The Heartbreakers, Widespread Panic, Wilco, The Allman Brothers Band, and the legendary Willie Nelson. Kel Executive Services handled the overall security planning for this multi-faceted 3-day festival. A&O provided mounted patrol security on the Winston Farm site. The festival featured dozens of musical acts, workshops in hoop dancing and kung fu, multiple intriguing art installations and camping packages. The entire security team was faced with daunting challenges when a weather evacuation was necessary on Sunday and the event had to be cancelled. Although load-out was challenging for fans and staff alike, everyone was evacuated safely. The Langerado Music Festival for six years was a forerunner of today’s festivals. A&O served in 2008 at the festival at the Big Cypress Seminole Indian Reservation in the South Florida Everglades. A&O Troopers patrolled the concert grounds, helped fans with parking and directions, monitored entryways to enhance public safety. An estimated 25,000 music fans attended the four-day festival. The line-up included R.E.M., Beastie Boys, 311, Phil Lesh & Friends and 80 other acts. Alpha & Omega also participated in Green Langerado, a concentrated approach to staging a green concert experience. All materials used in camp were evaluated for their recycling potential. All hay and horse feed were purchased from local vendors and manure was donated to local farmers for fertilizer. Kel Executive Services (KES) provided security for the Freedom of Speech ’06 tour of Crosby Stills Nash Young (CSNY). The North American tour, the first for the legendary rock and roll group in four years, covered 30 cities from Philadelphia to California and up into Canada from July 6 to mid-September. Frank Keller, president of KES, personally traveled the entire tour with Neil Young. Keller provided a number of security services including advance site evaluations, travel planning, hotel inspections, executive protection, route planning, crowd management, and meeting coordination. The CSNY tour offered special security challenges at such high profile venues as Denver Red Rocks amphitheater and the Hollywood Bowl. Special challenges were presented by the tour logistics, the venues, the pace and the political theme of much of the music. Frank Keller, A&O and KES founder and president, served on the security crew responsible for the American portion of Bob Geldof’s LIVE 8 concert to raise awareness for African famine and debt relief. The Philadelphia concert was held in conjunction with other concerts staged simultaneously in London, Berlin, Paris and Rome. The concert was held July 2 in Philadelphia at the foot of the Philadelphia Museum of Art on the Benjamin Franklin Parkway. More than one million people showed up to hear 22 music acts and 12 celebrity presenters. Talent included Destiny’s Child, Bon Jovi, Coldplay live from London, Dave Matthews Band, Paul McCartney and U2 live from London, Alicia Keys, Tim McGraw live from Rome, Stevie Wonder, Pink Floyd live from London, Richard Gere, Salma Hayek, Jack Nicholson and others. Keller’s responsibilities included assisting the America Online broadcast crew which simulcast all the concerts online. Plus, he escorted talent to their positions on stage from their hotels and tour buses. He also helped monitor security backstage, immediately in front of the stage and “front of house” to see that performers were safe. The Alpha & Omega Mounted Security Patrol participated in one of the milestone music events of all time. Billed as the 25th anniversary of the original Woodstock music festival, the Woodstock ’94 Arts and Music Festival was staged on the 843-acre Winston farm in Saugerties, New York, August 12 to 14, 1994. The festival featured 30 bands and an estimated 450,000 people in attendance. The Woodstock site created the third largest “city” in New York during the festival weekend. Alpha & Omega Troopers joined the New York State Police and several private security firms to manage the sizeable crowd (the first time ever for a private mounted patrol to be contracted for a music festival.) A strong relationship was forged with the New York State Police, a bond that continues today. Troopers were responsible for traffic management, parking patrols, opening passageways for band members and VIPs, clearing landing zones for helicopters, and monitoring crowd movement and behavior. Kel Executive Services handled security for the CounterPoint Music and Camping Festival in Atlanta. KES provided overall security consultation for the 3-day electronic-based music festival. The diverse nature of the festival presented sophisticated security challenges. The festival featured Bassnectar, Skrillex, Pretty Lights, Steve Angello, and dozens of others. Fans experienced an Arts Village, cinema arena, live demos of extreme sports, and food vendors from Atlanta’s restaurants, food trucks and breweries, all set up along an 8,000- acre stretch of the Chattahooche River. A&O Troopers provided public safety services for a concert of metal’s “Big Four” which included Metallica, Slayer, Megadeth and Anthrax. Successful security professionals today are using a systems approach to provide full coverage of the assets they protect. The Woodlands Township near Houston, Texas, provides a textbook example of how to use mounted patrols to effectively provide a visible deterrent to criminal activity. ￼Consider the enormous scope of this master planned community: 28,000 forested acres. A million-square-foot retail mall and several village shopping centers. 36 places of worship. 16 schools. 1000 businesses. 165 miles of trails. 110 parks. A 17,000-capacity amphitheater. A 34-acre main-street-styled Market Street with stores, restaurants, specialty grocer and special event venue. A 500-physician hospital. Doctors’ offices. A 65,000-square-foot resort/ conference center. A 200-acre lake. Seven golf courses. Tennis courts. A waterway and water park. Homes, apartments, condos, and townhouses. More than 50 public art sculptures. 6,000 acres preserved as green space. The challenge of providing a comprehensive public safety program for such a varied and widespread campus led to forward-thinking and innovative approaches to security that called for a highly visible and people-friendly component to the security system. The A&O mounted patrol force covers the parking lots, truck courts, and pathways of the commercial developments of The Woodlands daily. High-density vehicle and pedestrian traffic areas like those in the Town Center are the ideal setting for effective use of a mounted horse patrol. The mounted patrol officers watch for nuisance disturbances, loitering, and criminal actions. Although officers do not carry weapons, riders are trained to use their horses in defense. One of the main reasons for the success of the mounted patrol at The Woodlands is the close collaboration with the Montgomery County Sheriff’s Office, the Constable’s Office, and the local city police departments with jurisdiction over the area. Mounted patrol officers are in constant radio contact with law enforcement, permitting everyone to act quickly and decisively to prevent or diminish a criminal act. The mounted patrol, along with other security components, was immediately put on high alert at the commercial center following the Sept. 11 attacks. They were among the first people to be called following the terrorist actions. In 2008 after the devastation of Hurricane Ike, Troopers were back on patrol within 48 hours of the storm. They were prepared with mobile equipment normally used by their festival patrol division. They used their tour bus, its industrial sized generator, special communications equipment, and a mobile office to get patrols back on the streets quickly. Troopers monitored lines at gas stations and supply distribution points, helped power crews, directed traffic, and patrolled streets filled with debris. Alpha & Omega is proud to be a part of The Woodlands Township which enjoys one of the most enviable safety records in the nation. Over the years, the Alpha & Omega Mounted Security Patrol has welcomed patrons to Chicago’s famed United Center with their parking lot patrols. The United Center, home to the Chicago Blackhawks and Chicago Bulls, is the largest arena in the United States. Since reopening in 1994, the United Center has hosted over twenty million guests at more than 200 events each year. Some of the events the United Center has hosted include the 1996 Democratic National Convention, The Rolling Stones, Eric Clapton, Bruce Springsteen and the E Street Band, Paul McCartney, U2, The Who, The 3 Tenors, Ringling Brothers and Barnum & Bailey Circus, Disney on Ice, the Big Ten Men’s Basketball Tournament, the Men’s NCAA Basketball Tournament, the Great Eight Classic, Illinois College Basketball, and Champions on Ice. The Alpha & Omega Mounted Security Patrol protected fans of the World Cup Soccer matches at the Cotton Bowl in Dallas, Texas. Hosted by the Federation Internationale de Football Association (FIFA), 24 countries competed in the month long, multi-city tournament. The total audience created the second largest spectator event in the world with more than 3.6 million people. Officials from Alpha & Omega met with Cotton Bowl planners and FIFA officials for two years for a sort of “security school” in preparation for the event. Special study of profile situations helped Alpha & Omega ready their Troopers for all possible emergencies. Because of a trend in Europe toward violence at soccer matches, everyone needed to be prepared. Along with the traditional challenges of crowd control, security personnel had an added threat. The so-called “soccer hooligan” could create chaos and endanger lives and property. In a scorching heat wave, A&O Troopers stood post with other law enforcement personnel from the Dallas Police Department. A&O squads had trained in a semi-military format and were arranged in platoons for a tightly regimented patrol. Troopers’ and horses’ detailed training enabled them to work efficiently around helicopters, ambulances, media trucks, buses of team members, and other potential distractions. Alpha & Omega’s 15-plus year association with The Woodlands Township gave Troopers the experience they needed for Super Bowl excitement in 2004. Held at Reliant Stadium in Houston, the Super Bowl game between New England and Carolina attracted almost 72,000 people to the city. Troopers with Texas-based Alpha & Omega Mounted Security (A&O) patrolled The Woodlands Township where many visitors and Super Bowl staff had their headquarters for the two-week pre-game festivities and preparations. Alpha & Omega Mounted Troopers provide race course security for the annual Memorial Hermann Ironman Texas at The Woodlands, Texas. The event is produced by World Triathlon Corporation. Participants begin with a 2.4 mile swim in Lake Woodlands then bike 112 miles west through The Woodlands toward rolling farmland. The final portion of the race is a 26.2 marathon course within The Woodlands finishing on Market Street where Troopers regularly patrol. Mounted Troopers are especially effective at events like Ironman Texas because they sit high above the crowds. From that vantage point, they can evaluate crowd congestion, work trouble spots, and be highly visible to someone in need of help. The Alpha & Omega Mounted Security Patrol patrolled the grounds of this open air shopping center, providing information and assistance to shoppers, and protecting retailer property. The upscale center includes high end retailers, restaurants, and businesses offering financial, medical, travel and health/beauty services. Located at Memorial Drive and Sam Houston Parkway, the shopping village serves a primary market of more than a quarter million people. Alpha & Omega’s extended security division provides patrols for Market Street, an award- winning retail development in The Woodlands Township near Houston, Texas. The company has provided mounted security for the project for some time. Because of its pedestrian-friendly design, the center was a natural for foot patrols as an extension to its security plan. Market Street is a town-center style retail complex with a stylish design, offering a convenient shopping destination amid an office environment. The buildings are centered around a world-class public space that provides a downtown focal point for the surrounding residential neighborhoods. The center’s theme was created as a mercantile-style town center. A gourmet grocery, loft, office space, and second story cinema, contribute to the small town feel. Tree-lined walkways, a heavily shaded oval central park, and a series of fountains provide communal gathering spaces. A multitude of storefront designs and a mixed-bag of regional architectural styles create “instant history” in the center. The Pavilion amphitheater at Bethel Woods, part of the Bethel Woods Center for the Arts, opened to the public on July 4, 2006, with a performance by the New York Philharmonic. Since then, Bethel Woods has presented a wide variety of musical genres and performers including Bob Dylan, Elton John, Phish, The Eagles, Zac Brown Band, and James Taylor, Jimmy Buffett, and Luke Bryan among countless others. Bethel Woods Pavilion is situated on a 37-acre field that is part of the 600-acre site of the original Woodstock festival that attracted almost half a million fans in August of 1969. Woodstock is a pivotal event in the history of music festivals, providing a blueprint for the many festivals now a regular part of the year-round music offerings across the country and internationally. Located in the Baltimore/Washington corridor off Route 29 in Columbia, Maryland, Merriweather is nestled within the 40 beautiful preserved acres which have helped to make Merriweather an annual stop for many artists over the past 36 seasons. Merriweather was designed by the world-renowned architect Frank Gehry. The Pollstar Concert Industry Awards named Shoreline Amphitheatre the Best Large Outdoor Amphitheatre in the United States. The Wall Street Journal called it “The Cadillac of Amphitheatres.” The San Francisco Chronicle said it is “the biggest and most beautiful tent in the world.” And, the world’s most popular and talented entertainers call Shoreline Amphitheatre their Bay Area home. Nestled in the foothills of Mount Diablo, the Chronicle Pavilion at Concord is an entertainment showplace that has been enjoyed by millions of people since first opening its doors in 1975. Aaron’s Amphitheatre has been the premier concert venue in the Southeast since its debut season in 1989. Built specifically for popular music, the amphitheatre offers a state-of-the-art musical experience for both patrons and performers. Superior sound reproduction, advanced lighting capabilities and clear, unrestricted sight lines make Aaron’s Amphitheatre the favorite summer concert site for the avid music fan. The facility and a dose of Southern hospitality have inspired some truly historic performances by the world’s most incredible live musicians including Steve Miller Band, Tim McGraw, Sting, Dave Matthews Band and Jimmy Buffet. The Concord Pavilion is the top East Bay concert venue for big-name bands. It attracts top-flight touring acts which often stop by the other Bill Graham Presents operation, Shoreline Amphitheater in Mountain View. Sleep Train Amphitheatre, located 30 miles north of Sacramento, is a $25 million state-of- the-art concert facility serving all of Northern California. The open-air music center has 8,000 reserved seats and room for another 10,500 on the Festival Lawn. The amphitheatre features top-name entertainers and excellent sound, sightlines and video screens in concerts all summer. White River Amphitheater, Auburn, WashingtonWhite River Amphitheater, home to 2004 Farm Aid, is situated on Muckleshoot Indian Reservation about 35 miles from Seattle and 15 miles from Tacoma. The sold-out Farm Aid concert was hosted by Willie Nelson, Neil Young, John Mellancamp and Dave Matthews. The 20,000 seat Gorge amphitheatre is host to some 25 concerts every year. Over the years, it has staged performances by some of the biggest names in show business including: Aerosmith, Jimmy Buffett, Britney Spears, Tina Turner, Bob Dylan, Van Morrison, KISS, Red Hot Chili Peppers, Chicago, Joni Mitchell, Dave Matthews, Phish, Metallica, Rod Stewart, Van Halen, James Taylor, Paul Simon, BB King, Bonnie Raitt, Jackson Browne, Shania Twain, John Mellencamp, Ozzfest, Motley Crue, Santana and many, many more. Alpine Valley Music Theatre is located about 40 minutes southwest of Milwaukee. Alpine Valley is one of the largest outdoor amphitheatres in the country with a capacity of 35,000 patrons. Celebrating over 20 years of music history, Alpine Valley typically hosts between ten and fifteen concerts each summer season. Some of the acts hosted include: Jimmy Buffett, Dave Matthews Band, Aerosmith, KISS, Bon Jovi, Run DMC, Creed, 3 Doors Down, and Phish. Walnut Creek is Raleigh’s World-Class Outdoor Music Center. Built in 1991, the outdoor concert facility is the heart of nightlife for the Triangle and eastern North Carolina. Walnut Creek Amphitheatre stands out as one of the most beautiful, technologically advanced, and successful amphitheatres in the world. It features the most modern state-of-the-art acoustics and video of any facility of its kind. The amphitheatre can accommodate 20,000 fans, and is a completely open-air music center. At one of the most unique event sites in Indiana, headliners from funk to folk bring music lovers to Verizon Wireless Music Center (formerly Deer Creek Amphitheater). The 220-acre complex has featured Toby Keith, No Doubt, Phish, Hank Williams Jr., Evanescence and ￼scores of other top fan favorites. A 6,000-seat pavilion.